It’s been one of the biggest enterprise buzzwords of the 21st Century: collaboration. Unfortunately, improving your collaboration efforts is easier said than done. And those were the issues we wanted to explore in my webinar on SharePoint and collaboration. Or, more specifically, How to use a SharePoint Team Site effectively for collaboration. A big thanks goes to Rebecca Jackson for turning some session highlights into an awesome infographic—it inspired us to create one of our own. In the remainder of this post, we’ll be exploring these highlights in more detail. Check out the webinar here: 25 mistakes to avoid in SharePoint or Office 365. I’d also encourage you to visit my table of contents of blogs, videos and downloadable SharePoint files to help you learn more about SharePoint. Check out the awesome original, I am not even sure I needed to turn it into an Infographic. Thanks Rebecca! You can do many things with SharePoint, but first of all you need to have a purpose. The platform is too versatile to jump in without planning, and depending on the size of your organization or volume of content, you may want to create subsites, too. So, you need to make sure you have a clear plan set in place before you begin trying to set up a Team Site for collaboration. Any columns you create in your lists and libraries cannot be stored within them, which means they’re not centralized and cannot be reused. Instead, you should try and use Site Columns—available in the site settings—to create a column that, instead of belonging to the document library or list, will actually belong to the site itself. Therefore, all of the lists and libraries in the site and subsites will be able to reuse that column where its configuration has been centralized in one place, saving you loads of time and effort. Once your site has the right lists, libraries, views, workflows and all the elements you need, it may be worth creating a template of that site to use again at a later date. Saving a site template stores it in the Solutions Gallery for further use. Templates can quickly be applied to other SharePoint environments, and can be developed further within Visual Studio. This one sounds a bit odd, I know. But for every SharePoint implementation that I have done, I’ve tried to call it something else. Why? Well, previous users may have had bad experiences with SharePoint 2003, for example, and have since vowed never to use SharePoint 2013 or 2016, even though they’re completely different platforms. Because of the negative connotations that have been attached to the platform (albeit unfairly) – it’s slow, it’s disjointed etc. – those users aren’t willing to give it another shot. Sidestepping the SharePoint title helps users that are less familiar with the versatility of the platform understand the amount of actual stuff it can do. Plus, coming up with an alternative name for your Team Site gives you a chance to get your creative juices flowing. SharePoint Composites allow you to quickly create solutions within SharePoint and Office 365 without code. By assembling and connecting the building blocks of functionality in SharePoint—such as custom webpages or Web Parts—you combine data, documents and processes in a quick and easy manner. Check out the SharePoint Composites Handbook to get to grips with building no-code solutions. Aim to create a communications plan you can all follow for the sake of clarity and organization. Make sure the entire team is on the same page. Let’s say I have a contract with Microsoft that I’ll be needing to update frequently. So, where do you store it? Do you put it in the ‘Contracts’ folder, and add a new folder for Microsoft? Or do you put it in the ‘Customers’ folder, and add a new folder for contracts? By using a folder structure, your document can only physically be in one place at a time. So you waste time looking for it because you don’t know (or can’t remember) where you put it. With metadata, you tag that document with the word ‘Microsoft’ and ‘Contract’. So instead, when you’re searching for the document in the future, you’ll can search via those tags to find that document (and any related files) instantly. With the right metadata in place, file searching becomes much faster saves you valuable time. When managing SharePoint security in your Team Site, there are two Groups to take note of. But first thing’s first - never give permissions directly to an individual user. Always give permissions to a group. Here’s what you need to do: give permission to SharePoint Groups, but inside of your SharePoint Groups, add an Active Directory (AD) Group and add your users inside of your that group. This way, when you change users it won’t launch a full search crawl that will slow down your environment. For more information, check out this MSDN article. All SharePoint Team Sites are linked together through a hierarchical structure, stemming from what is called the ‘root site’. This grouping of sites is called a site collection, where each individual site shares certain qualities. For example, any SharePoint Groups you create are shared by the entire site collection. The same can be said for databases, style libraries and many others. When in doubt, just create a site collection! SharePoint is extremely customizable, and so it can be tempting to change everything you can. But don’t go overboard. A lot can be done simply out-of-the-box and without code. I’m not saying you don’t need to code, but try and stay away from creating custom web parts to do something that can be done using in-built SharePoint tools, for example. In terms of branding, remember to always keep it simple and clean – having too much going on will only create confusion. First of all – if your governance plan is too big, no one will read it. It won’t work. It can be a document, a wiki, whatever’s best for you – as long as it works. As long as it sets roles and responsibilities, as long as it sets policies on sites… your goal is to set clear rules that are easy to follow. A lot of people associate governance with countless regulations that scare you into compliance. Yes, governance is important, but it doesn’t need to be a giant document. I’ve written a few different articles on mastering your governance plans, which you can view here. But most importantly, keep it simple. 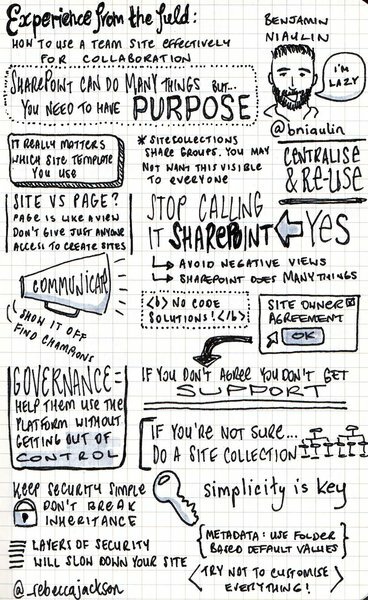 And that notion of simplicity can really be applied across the SharePoint Team Sites as a whole – so always keep it in mind!